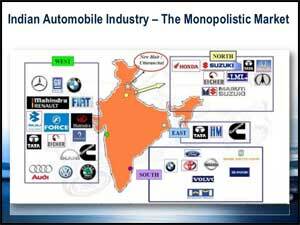 The Indian automobile industry is one of the largest in the world. The automobile industry accounts for 7.1 per cent of the country's Gross Domestic Product (GDP). As of FY 2014-15, around 31 per cent of small cars sold globally are manufactured in India. The Two Wheelers segment with 81 per cent market share is the leader of the Indian Automobile market owing to a burgeoning middle class and a young population ready to spare their purse. In April-January 2016, exports of Commercial Vehicles registered a growth of 18.36 per cent over April-January 2015. The Indian automobile market is expected to make India a leader in the Two Wheeler and Four Wheeler market in the world by 2020. The Indian Automobile industry has attracted Foreign Direct Investment (FDI) worth US$ 14.32 billion during the period April 2000 to December 2015, according to data released by Department of Industrial Policy and Promotion (DIPP). The Indian automotive sector has the potential to generate up to US$ 300 billion in annual revenue by 2026, create 65 million additional jobs and contribute over 12 per cent to India's Gross Domestic Product, as per the Automotive Mission Plan 2016-26 prepared jointly by the Society of Indian Automobile Manufacturers (SIAM) and the Indian government.